Bullet Bill Barrage (or World 3-2) is the second level of World 3 and the tenth level overall in Super Mario Run. The level starts with a line of cloud platforms, along with a jump onto a higher line of cloud platforms where Bull's-Eye Bills appear. The first Pink Coin appears, and the player must simply walk into it to collect it. After making it onto a solid platform, more cloud platforms follow, along with regular Bullet Bills. The player must take the higher path and, at the end of the line of cloud platforms, jump off of a Bullet Bill to get the second Pink Coin. 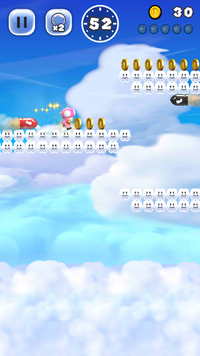 After reaching another solid platform, the player must jump off of three consecutive Bullet Bills to land on a line of cloud platforms with the third Pink Coin. After dropping down, the player will cross another solid platform, as well as a Red Ring. The player has the option to collect the Red Coins; immediately afterwards, the fourth Pink Coin will appear on top of a ? Block. The player must simply jump onto the ? Block to collect it. After crossing yet another solid platform, the player will approach the fifth and final Pink Coin between two cloud platforms; to get it, the player must either take the lower path and jump or use the Super Star obtained from the Red Ring to collect it. The player should remain on the lower level to evade the groups of Bullet Bills. After crossing one final solid platform, the player must quickly jump from cloud platform to cloud platform while evading the Bull's-Eye Bills, which leads directly to the Goal Pole. The level starts with a line of cloud platforms, along with a jump onto a higher line of cloud platforms where Bull's-Eye Bills appear. The first Purple Coin is inside a Brick Block soon after. After making it onto a solid platform, more cloud platforms follow, along with regular Bullet Bills. After a while, the second Purple Coin appears; to get it, the player must jump on the nearby Brick Block and then on a Bullet Bill. After reaching another solid platform, the player must jump off of three consecutive Bullet Bills to land on a line of cloud platforms that leads to a jump to the third Purple Coin. After dropping down, the player will cross another solid platform, as well as a Red Ring. The player has the option to collect the Red Coins; immediately afterwards, the fourth Purple Coin will appear up above. The player must jump onto a ? Block and jump again to get it. After crossing yet another solid platform and several more cloud platforms, the player will approach the fifth and final Purple Coin, at the end of the lower level. After crossing one final solid platform, the player must quickly jump from cloud platform to cloud platform while evading the Bull's-Eye Bills, which leads directly to the Goal Pole. The level starts with a line of cloud platforms, along with a jump onto a higher line of cloud platforms where Bull's-Eye Bills appear. The first Black Coin can then be collected by jumping on a ? Block and Brick Block, then jumping onto a stone block, then jumping again. After making it onto a solid platform, more cloud platforms follow, along with regular Bullet Bills. After a while, the second Black Coin appears; to get it, the player must jump on the nearby Brick Block and then quickly jump on a Bullet Bill. After reaching another solid platform, the player must jump off of three consecutive Bullet Bills to land on a line of cloud platforms that leads to a jump off of a Bull's-Eye Bill to the third Black Coin. After dropping down, the player will cross another solid platform, as well as a Red Ring. The player has the option to collect the Red Coins; immediately afterwards, the fourth Black Coin will appear up above. The player must jump onto a ? Block and jump again to get it. After crossing yet another solid platform and several more cloud platforms, the player will approach the fifth and final Black Coin, at the end of the higher level. After crossing one final solid platform, the player must quickly jump from cloud platform to cloud platform while evading the Bull's-Eye Bills, which leads directly to the Goal Pole. Italian L'attacco dei Pallottoli Bill! The Attack of the Bullet Bills! This page was last edited on April 17, 2019, at 19:32.